Students, faculty and staff will have new dining options on campus this year as Sodexo begins its work at William & Mary. The company’s contract with the university began July 1, and it has been working since then to implement a variety of changes to the W&M dining program, including adding new residential, catering and retail options as well as the university’s first food truck. Jeff McClure, resident dining manager, estimated that renovations to all of the university’s dining facilities, including the Law, Business and Education schools, as well as two “pop-up trucks” that will traverse the campus, cost approximately $4.5 million. The work done resulted in no increase to the student meal plan, or a substantial increase in costs to the university. The improvements were underwritten by Sodexo as part of the five-year contract agreement. Center Court at the Sadler Center will offer a variety of food choices including new global choices, foods for those with special dietary needs, vegetarian and vegan options and classic favorites from pizza and sandwiches to salads and burgers. The Commons Dining Hall will serve local favorites including seafood dishes. Diners will also be able to enjoy international foods, a variety of breads and sweets, as well as foods prepared without gluten or the top eight common food allergens at the Simple Servings station. The Commons will also house Chancellor’s Bistro, a full-service, 85-seat, restaurant that will offer local, seasonal foods. No fried food will be served at the restaurant, and everything will be made from scratch. No three-course meal will exceed 1,600 calories. The Marketplace in the Campus Center underwent a major renovation and now features fresh food options including salads, deli items, soups and sushi as well as fair-trade certified Aspretto Coffee. 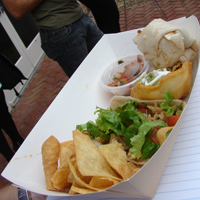 The 1693 BBQ food trailer, parked outside of the Campus Center, will serve a variety of barbeque favorites. The new Wholly Habaneros food truck will park at multiple locations on campus and will serve tacos, burritos, quesadillas and more. Members of the campus community can follow the food truck on Twitter to see its location daily (@WMDining). People looking for a snack while studying or working in Swem Library will be able to enjoy Aromas coffee shop; those at the Rec Center can experience a self-serve Jamba Juice smoothie bar. Hungry members of the Tribe will also be able to find food options at Phi Beta Kappa Hall’s Simply to Go and the Student Xchange in the Sadler Center. 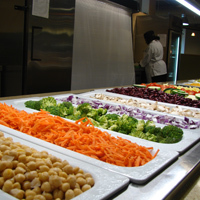 William & Mary’s professional schools will also see changes to their dining options. Zime Café at the Law School, Monticello’s Café at the School of Education andBoehly Grill and Argo Tea at the School of Business will offer sandwiches, salads, soups, bakery items and more. Although W&M community members will be seeing many new dining options, they will also be seeing plenty of familiar faces. All of the front-line staff members who worked for the previous dining contractor were offered the chance to retain their jobs under Sodexo, and most of them did, said Eden Harris, assistant director of marketing and communications for W&M Dining Services. Among the new hires that Sodexo is making is a campus dietician who will develop educational programming and work directly with students who have special dietary needs. Chancellor’s Bistro, offering full-service dining with menus inspired by and showcasing local, seasonal ingredients. The restaurant will offer fresh, sustainable items, prepared a la carte in a restaurant environment. Dinner will be served Thursdays through Saturdays, and reservations (dining.wm.edu) will be requested. 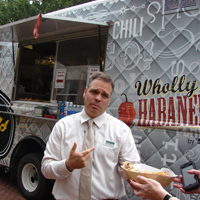 Wholly Habaneros, William & Mary’s first-ever food truck, will offer tacos, burritos, quesadillas, nachos and burrito bowls. Aroma’s will open in Swem Library and will offer both hot and cold beverages, as well as a variety of bakery and café items. The School of Business will feature Argo Tea, which will offer a variety of hot and cold tea-based beverages, Illy coffee, artisan sandwiches and baked goods. Boehly Grill returns with handmade soups, sandwiches, flatbreads and freshly prepared grab-and-go options. Jamba Juice will open a self-serve smoothie bar in the Rec Center. Simply-to-go will operate out of the Dodge Room in Phi Beta Kappa Hall and will feature grab-and-go soups, sandwiches, sushi and more. 1693 BBQ will be a pop-up restaurant featuring recipes from Sodexo’s executive chef Ernest Servantes, who won the final round of Food Network’s “Chopped grill Masters.” From pulled pork sandwiches to juicy, smoked chicken sausage and tasty tofu, 1693 BBQ will be located primarily at Campus Center. The Monticello Café will open in the School of Education and will offer freshly made sandwiches, soups and grab-and-go options, and will serve coffee by Intelligentsia, a Chicago-based coffee brand sourcing ethically and sustainably-harvested coffee, recognized by The New York Times, Zagat, Food & Wine, The Wall Street Journal and more. Marketplace will reopen as newly renovated space bringing an expanded soup and salad bar, updated grill and kitchen options and will feature artwork from the President’s Collection. Zime will be located in the Law School offering freshly prepared salads, sandwiches, pastries and ethically sourced coffee. Students Xchange will continue to provide access to food and beverages, sundries and daily necessity items, take-home meals and more, including a wide variety of healthy items with a greater emphasis on locally sourced products.Qdoba will continue to be a late-night option for students at the Students Xchange. The Crust, Pita Pit and Mooyah, tenants of the W&M Real Estate Foundation-owned Tribe Square, will begin accepting Dining Dollars, and Domino’s will continue to provide campus with pizza delivery. Cosi will open in the Lodge 1 area of in Sadler for Spring 2015. Offering their signature flatbreads, sandwiches, soups, salads and more, Cosi will offer online ordering through dining.wm.edu. Additionally, Cosi will provide student groups with affordable catering options. Work will begin in Lodge 1 in the fall.